Apparently, no, the ultrasound tech was not, in fact, shitting me. There were two little darlings growing in there, both measuring right on schedule. I smiled like a madwoman and giggled uncontrollably, but I think that was just my way of responding to the overwhelming fear that gripped me. Twins? How would they fit in me? I realized, as I hugged my elated husband, that my response was selfish, but my belly was flat and my frame was petite. Two babies? Two watermelons? In there? Fast forward to 29 weeks gestational age. One boy, one girl, one shortening cervix and all of a sudden I was in preterm labor. Jed had been back from guiding hunters (one of his jobs) for all of 24 hours when I demanded that he drive me to the hospital, an hour away, because I was in labor. He did have the gall to say, “I think you’re overreacting,” before putting some boots on and driving me to L&D, where they gave me some shots, gave me some more shots, then gave me magnesium sulfate and called the helicopter to fly me to Albuquerque to a level three NICU. After throwing up on my headset en route to Albuquerque and wondering how people ever fly in helicopters, we landed and I was transferred to a much softer surface, and then wheeled to a room with a glorious view of the mountains. I was still vomiting every hour or so, which was one of the less pleasant side effects of magnesium sulfate (right up there with feeling like I might spontaneously combust). A doctor came in to check my cervix, which was dilated to an intimidating 3 cm. I called Jed immediately – he was still driving from our first hospital – and told him to stop messing around, we were about to have tiny babies. The NICU folks came in my room and told me things about necrotizing enterocolitis, cerebral palsy and umbilical IVs. Hospital admissions people came in and asked me to sign admissions paperwork. My nurse asked me to vomit into a bucket. I couldn’t see straight, I couldn’t think straight, I was sweating profusely in a sixty-degree room, I was dilating, the perinatalogist who checked my cervix talked to me about my impending C-section (thanks to my breech boy) and the sun rose and set two times. My labor stalled thanks to the wonder drug, in spite of my gut feeling that I was about to be the mother of tiny, furry, translucent babies. So I lived in Albuquerque, in the hospital, contracting away, for the next month. I taught myself to knit, watched episodes of Project Runway all day, ordered hospital food three times a day, befriended the nurses and kept cooking babies. I had visitors every single day that I was there (if you count Jed as a visitor, which I did – he didn’t have to be there). I also developed cholestasis of pregnancy, a disease which causes unbearable itching for the expectant mother and can lead to fetal demise in the worst case scenario for little ones. The perinatalogists and I decided that if I went into labor again, I would have the babies at that point and I kept them cooking we would deliver them at 36 weeks. 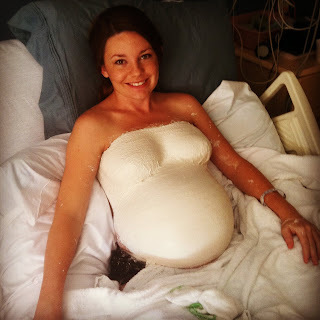 At 36 weeks, I could potentially go back home to my original doctors, who would let me attempt a vaginal delivery. The doctors in Albuquerque weren’t comfortable with a breech birth (even if it was the second, smaller twin) and after thinking long and hard about it, I decided that I didn’t want doctors who weren’t comfortable with a breech delivery to attempt it with my babies. As much as I wanted to avoid a C-section, I wanted healthy babies more. I went into labor again at 33 weeks and 2 days. I wasn’t convinced that I was in labor, but I knew that baby A was lower and I had some minor back pain accompanying my normal contractions. So when the hospitalist checked my cervix and said I was a stretchy three and 80% effaced, I was surprised. When he came back an hour later and said I was definitely a four and almost 100% effaced, I was shocked. He said I had about half an hour before the surgery and I asked, “Why so soon?” to which he replied, “Better now that when it’s an emergency.” My contractions weren’t particularly painful, and I wanted to experience labor, but he was being logical, so we got ready, sent text messages to the almost grandparents and then walked down the hall to the OR. I got the spinal, got scrubbed all over my abdomen and was just getting cut open when Jed came into the OR and held my hand. There were NICU nurses ready to catch my babies and whisk them away. I felt cold, anxious and like the situation was totally out of my control (which it was). I heard the doctor say, “A, fluid, clear,” and then I heard Clara Blue cry for the first time at 2:23 am on October 24, 2011. I cried when I heard her – she sounded so strong and healthy. Then, “B, fluid, clear,” at 2:24, and Cormac Leo started crying – a little weaker, but still a great sound. The NICU nurse showed me the little guy, then whisked him off and I laid there, getting cleaned up and sewn shut and wondering how my children were doing. Jed went to the NICU almost immediately and took pictures of the pair of them so I could see what the y looked like. After a few hours, once I had eaten, cleaned up a little, and could feel my legs again, Jed and his best friend wheeled me down to the NICU to meet my creations. Clara was on a nasal cannula, but was a healthy 4 lbs. 12 oz. and doing just fine. Cormac was having a harder time breathing and was on a bubble CPAP. He weighed 3 lbs. 15 oz. and both twins were 16 ¾ inches long. I felt strangely detached from them both, like I was glad they were fine, but that was it. I started pumping that day, and got to hold Clara the next day. It was wonderful to finally get to hold her and I had no problem bonding with her as soon as I got her in my arms. It was a few more days before I held Cormac, but when I did, he was calm and quieter than he normally was and then he went to sleep on my chest almost immediately. I pumped the entire time that the twins were in the NICU and, thankfully, I produced enough milk for both of them and then some! Their breathing improved, Cormac had a heart murmur that resolved itself, they started eating like champs and then, on November 20, we all got to go home! It was wonderful (and unbelievably lucky) that they both got discharged at the same time and the feeling of driving our babies home after waiting for them all that time was unlike anything I’ve ever felt. It was worth every bit of what it took to get us here. Yay sister! 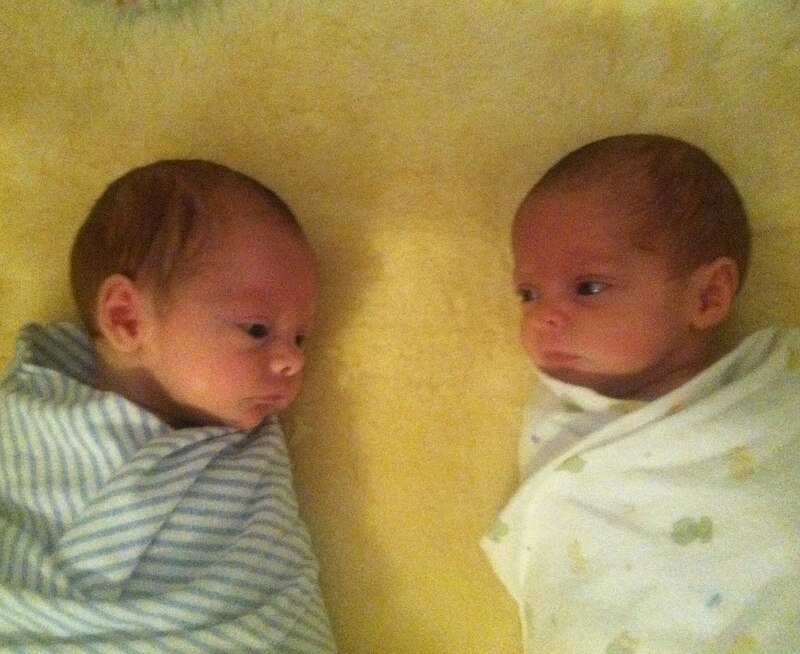 Two months in the hospital and two healthy babies. Am I a double uncle now? Awesome story! Loved reading it!